"The story of a man whose only meaningful contact with the world is through smells, who is slowly working his way out of his mother's basement out into the wide world of people and relationships." 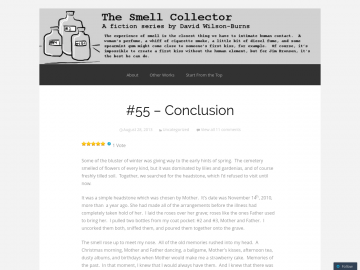 The Smell Collector tells the story of Jim Bronson and Marie Bellman. Jim has a hobby. He collects smells. Marie happens to have the most beautiful smell. What happens when Jim tries to collect Marie? A humorous, quirky, possibly disturbing but definitely heartwarming tale of two lonely-hearts who are brought together by smells. The Smell Collector has not been recommended yet.